The Associated Press reported in June 1012 the precise numbers on US forces in Kuwait, a presence that Pentagon officials has only reluctantly acknowledged. There were 15,000 troops stationed at Camp Arifjan, Ali Al Salem Air Base and Camp Buehring, in Kuwait. The U.S. uses Kuwait in its war planning as “staging hubs, training ranges and locations to provide logistical support” and to give it “flexibility” should the White House decide on a “pre-emptive” military strike against Syria or Iran. The U.S. military is maintaining at least 10 bases around the tiny emirate, including a command headquarters, a logistics center and two Air Force bases. During the two decades since U.S. and Coalition forces liberated Kuwait, a robust US presence -- military and civilian -- has become virtually a fixture in Kuwait. This posture has been encouraged by a welcoming host government that has seen its own long-term security linked to a significant USG presence, particularly on the military side. The generally hospitable official Kuwaiti environment, expressed in material terms by over US$1.2 billion annually in such benefits as free access to bases, waived port and air support fees, customs waivers, subsidized fuel and other services, rendered Kuwait an indispensable ally in the conduct of Operation Iraqi Freedom (OIF), and the US presence in Kuwait significantly facilitated US operations in the AF/PAK theater. US military operational flexibility here was governed by the favorable terms of a Defense Cooperation Agreement (DCA) with the Government of Kuwait signed in 1991 and extended for ten years in 2001; at the conclusion of the extension, the DCA continued in force indefinitely unless terminated by either side on one years' written notice. But with 17 USG departments and agencies present as of 2010, the Government of Kuwait directly or indirectly supportd more than just the U.S. military (which had ten support locations in Kuwait, including ARCENT forward headquarters and the largest USG military logistics facility in the world), and upwards of 15-20K military personnel on the ground at any one time. Civilian support included funding positions for the Federal Highway Administration, a U.S. Customs team, a Coast Guard contingent of 117, and providing free land and a generous energy subsidy (at the same rate as that provided other USG agencies in Kuwait of .66 US cent/kw hour) for IBB operations that reach from Europe to Asia. The material support and general ease and flexibility of USG operations here -- from beaming radio and satellite programming well beyond the region, or being able to conduct realistic live-fire training at Kuwait's huge Udairi Range -- is irreplaceable, at least in the near term. A US consulate was opened at Kuwait in October 1951 and was elevated to embassy status at the time of Kuwait's independence 10 years later. The United States supports Kuwait's sovereignty, security, and independence as well as closer cooperation among the GCC countries. In 1987, cooperation between the United States and Kuwait increased due to the implementation of the maritime protection regime to ensure freedom of navigation through the Gulf for 11 Kuwaiti tankers that were reflagged with US markings. The US-Kuwaiti partnership reached dramatic new levels of cooperation after the Iraqi invasion in 1990. The United States assumed a leading role in the implementation of Operation Desert Shield. The United States led the UN Security Council to demand Iraqi withdrawal from Kuwait and authorize the use of force, if necessary, to remove Iraqi forces from the occupied country. The United States played a major role in the evolution of Desert Shield into Desert Storm, the multinational military operation to liberate the State of Kuwait. Eventually, the US provided the bulk of the troops and equipment that were used by the multinational coalition that liberated Kuwait. The US-Kuwaiti relationship has remained strong in the post-war period. The United States has provided military and defense technical assistance to Kuwait from both foreign military sales (FMS) and commercial sources. All transactions have been made by direct cash sale. The US Office of Military Cooperation in Kuwait is attached to the American Embassy and manages the FMS program. Principal US military systems currently purchased by the Kuwait Defense Forces are Patriot missile system, F-18 Hornet fighters, and the M1A2 Main Battle Tank. In Kuwait, field exchanges are becoming more permanent. In February 2003, Army and Air Force Exchange Service [AAFES] operated exchanges for the Army at Camp Doha and two nearby air bases. Tactical field exchanges - 40-foot trailers stocked with merchandise - were quickly added to the half-dozen Army staging camps north of Kuwait City, he said. By mid-2003 those trailers had been replaced by 3,000-square-foot prefabricated buildings. 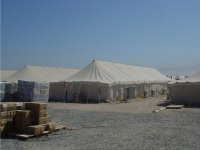 At Camp Arifjan, the Army's large logistical hub south of Kuwait City, AAFES operates a 24-hour exchange from a 10,000-square-foot festival tent. In Kuwait, business has been steady as troops heading north to Iraq stock up on favorites such as Gatorade, baby wipes, tobacco products and snacks, De Moss said. 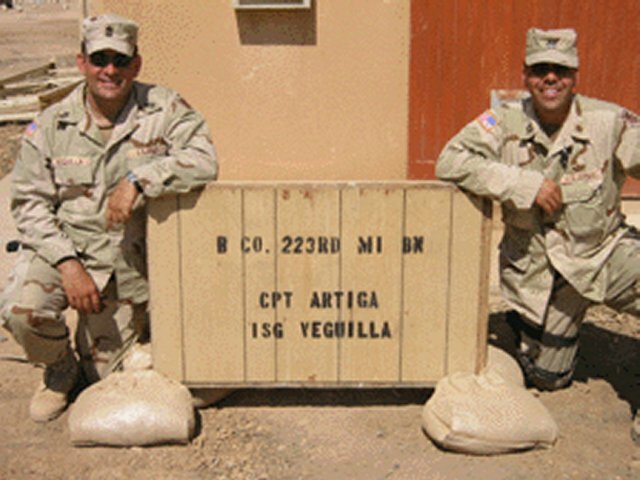 Then, troops redeploying from Iraq, no doubt craving one thing or another, hit the PX while waiting to ship home. It was called the surge. The annual, heightened period of activity from December through April when tens of thousands of US and coalition forces travel through Kuwait on their way to and from Iraq. The influx of troops and equipment pushed Kuwait's U.S. military camps to their capacities, creating an atmosphere with all the activity, anticipation and long lines of a busy amusement park. But there was a method to the seeming madness. Despite their sometimes haphazard appearance, the ebb and flow of these troop rotations, the largest since World War II, was meticulously orchestrated by command cell staff of Kuwait's desert camps. Serving as innkeepers, landlords, and entertainment coordinators, they reacted to the constantly-evolving conditions on the ground to keep the gateway between the United States and the central front in the war on terror running smoothly. Defense Energy Supply Center announced a one year contract for the period 1 March 2005 through February 28, 2005 (with two (2) six (6) month option periods). DESC reserves the right to reduce/delete transport trucks and change, add or modify transport truck origin points in Kuwait and delivery locations in Kuwait and Iraq as necessary. The services to be performed include transporting JP8 from the Mina Abdullah Truck Fill Stand (TFS) to Ali Al Saleem, Kuwait, Camp Buehring, Kuwait and Cedar II in Tallil, Iraq. DESC required 324 transport tank trucks with a minimum of 8,000 USG capacity and drivers to support military operations of up to 1,070,000 USG of Turbine Fuel, Aviation (JP8) per day from the Mina Abdullah Truck Fill Stand to Camp Buehring, Kuwait, Ali Al Saleem, Kuwait and Cedar II, Tallil, Iraq. Trucks are required 24 hours per day, 7 days per week. Trucks delivering to Ali Al Saleem should plan for two turns per day, approximately 55 miles (88.5 kilometers) from the Mina Abdullah Truck Fill stand. Trucks delivering to Camp Buehring should plan on one turn per day, approximately 80 to 110 miles (129 to 177 kilometers) from the Mina Abdullah Truck Fill Stand. Trucks delivering to Cedar II/ Tallil, Iraq should plan for at least a two-day turn around time, approximately 235 miles (378 kilometers) from the Mina Abdullah Truck Fill Stand. The United States is currently Kuwait's largest supplier, and Kuwait is the fifth-largest market in the Middle East for US goods and services. Since the Gulf war, Kuwaiti attitudes toward Americans and American products have been excellent. US exports to Kuwait totaled $787 billion in 2000. Provided their prices are reasonable, US firms have a competitive advantage in many areas requiring advanced technology, such as oil field equipment and services, electric power generation and distribution equipment, telecommunications gear, consumer goods, and military equipment. In 1993, Kuwait publicly announced abandonment of the secondary and tertiary aspects of the Arab boycott of Israel (those aspects affecting US firms). Kuwait also is an important partner in the current US-led campaign against terrorism, providing assistance in the military, diplomatic, and financial arenas. Kuwait is a small country and many of the challenges of distribution of goods and services found in other, larger countries do not exist in Kuwait. Kuwait International Airport is located south of the city and is easily accessed by expressway. It has a number of regular flights to destinations in the Middle East, Europe and Asia and can handle the world's largest aircraft. Kuwait's road system is well developed, with modern multi-lane expressways linking all areas of the country. There are no railways in the country. Kuwait has two modern ports -- Mina Al Shuwaikh and Mina Shuaiba -- which handle most of the country's imported goods. Both are equipped with facilities to manage most kinds of cargo. The small ports at Mina Shuaiba and Mina Abd Allah [Mina Abdulla] are also used for the export of oil products. Kuwait is working to regain its role as a transshipment point in the region following the significant drop in world trade with Iraq after the Gulf War. In 1996, the government authorized the establishment of a free trade zone in Shuwaikh port, which was inaugurated in November 1999. Over 80 percent of available space has been leased. The Government of Kuwait also reduced some port fees in an effort to encourage use of Kuwait as a transshipment point. The Government of Kuwait provided the U.S. military with essentially open access to ten bases as of 2010, including two air bases (Ali Al Salem Air Base and Al Mubarak Air Base at Kuwait City International Airport), five land bases (Camps Arifjan, Buehring, and Virginia, plus access to a Life Support Area facility located on Ali Al Salem Air Base -- which serves as the primary ARCENT hub for moving U.S. forces to CENTCOM forward-deployed bases -- and the joint U.S./Kuwait Khabari border crossing facility, which streamlies convoy operations into and out of Iraq), two port facilities (Kuwait Naval Base and Shuaybah Port), and a Defense Distribution Depot, a 100 acre warehouse complex which facilitates, on average, 1.4 million shipments per year of military equipment. Camp Buehring, notably, serves as a venue for U.S. Army/Marines "spin-up" training prior to deployment in Iraq (and, on occasion, Afghanistan) and served, as well, as a location where joint exercise training was conducted involving U.S. and Kuwaiti forces. Kuwait also provided U.S. forces with access to its 2,250 sq/km Udairi Range facility, considered one of the world's best venues for land/air live-fire and combined arms combat training. Approximately 90,000 U.S. military personnel per year utilized this facility for live-fire training purposes. 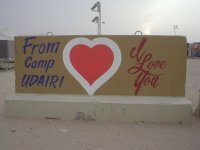 As of 2010, over 20,000 U.S. military personnel (including some 5,000 contractors) were located at bases and facilities in Kuwait, with the bulk at Camp Arifjan. Government of Kuwait support for the presence of these personnel, together with open access to this extraordinary range of facilties, was essential to the US ability to conduct OIF and enhanced US ability to conduct operations in the Afghanistan/Pakistan theater. In CY 08 alone, some 1,750,000 U.S. forces transited through Kuwait, either en route to Iraq or other deployment locations or back to the U.S., utilizing Kuwaiti bases and benefitting from Kuwaiti provided fuel and services. From 2005 until the end of 2008, Kuwait provided the U.S. military with quantities of subsidized JA1 aviation fuel for OIF. Since the expiration of this agreeement, the U.S. paid "fair market price" for the JA1 fuel. Under the terms of the Defense Cooperation Agreement, Kuwait continued to provide 7,500 gallons per day of free JA1 aviation fuel to the U.S. military. The Embassy-based Office Of Military Cooperation - Kuwait (OMC-K) facilitates training of Kuwaiti military counterparts and is also responsible for the conduct of an extensive Foreign Military Sales (FMS) program. The OMC-K training program included two components: FMS training (valued at USD 13 million in FY 2009), under which 314 Kuwait military personnel attended military schools in the U.S. in FY 2009 and a training exercise program that has engaged all components and staff of the Kuwait Armed Forces. The 214 FY 2009 students are a small fraction of the several thousand who had attended U.S. military schools since the early 1990's. In addition to training exercises that have included elements of Kuwait's land and air forces and its independent brigades, a particular focus has been on enabling the Kuwait Naval Force to participate as a contributing member of a coalition task force responsible for security in the central Arabian Gulf. As of 2010, the U.S had over 125 active FMS cases with Kuwait amounting to over USD 8.1 billion in value, including, among the more significant items, the sale of 218 M1A2 Main Battle Tanks and associated equipment, 39 F/A-18 C/D Hornet aircraft, 16 AH-64 Apache helicopters, and 5 Patriot Air Defense Systems. Notably, the Government of Kuwait was in final stages of agreement for a USD 1.1 billion purchase of six KC-130 tanker aircraft and associated support. As Kuwait is a "cash customer," the Government of Kuwait's contribution to the U.S. economy through equipment purchases is significant. The USG presence also contributes a reciprocal boost to Kuwait's economy, with average annual expenditures of over USD 6 billion/yr on fuel, base support operations, and transportation. The U.S. Army Corps of Engineers (USACE) presence in Kuwait, which pre-dates the Gulf War, was instrumental post-Liberation in helping Kuwait re-establish critical buildings and infrastructure; in recent years, it assisted in the reconstruction of a number of Government of Kuwait buildings while focusing its energies on construction projects in support of both the U.S. and Kuwait military at Ali Al Salem Air Base, Ahmed Al Jaber Air Base, 25th Commando BDE, 94th Yarmouk BDE, Camp Arifjan, the Udairi Range Complex, and the Khabari Military Crossing. USACE is presently involved in projects to upgrade Kuwait ammunition supply points and upgrade maintenance facilities on the Kuwait Naval Base. 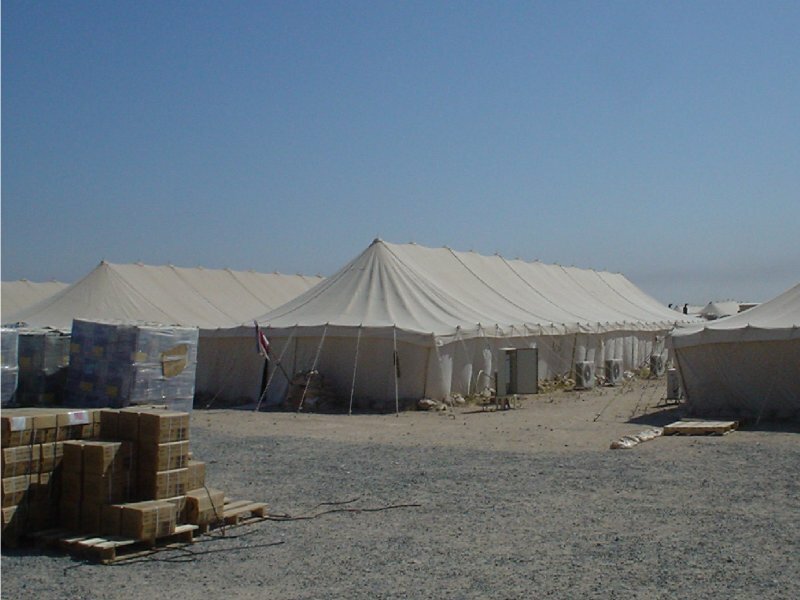 While USACE does not receive direct funding for personnel from the Government of Kuwait, personnel costs are built into FMS construction cases. The U.S. Coast Guard operates in Kuwait in support of CENTCOM and NAVCENT operations in the region. 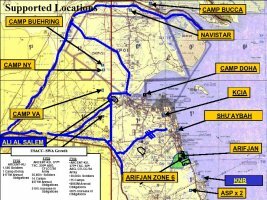 As of 2010, a USCG detachment of some 117 personnel conducted port security operations at Kuwait Naval Base and Shuwaybha Port related to U.S. military movements/shipments and protective measures for Iraq's Al-Basra oil terminal (ABOT). In addition, USCG personnel conduct periodic training of Kuwaitis in maritime law enforcement issues. 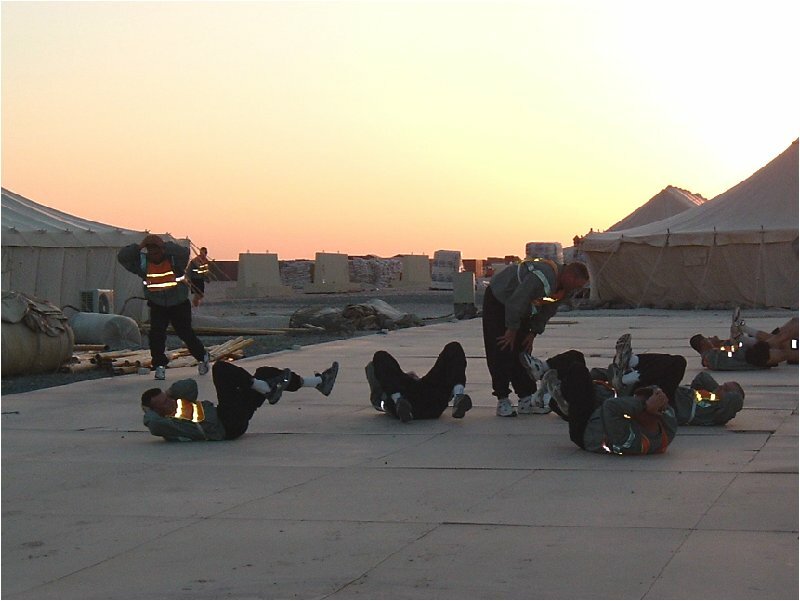 The presence of USCG personnel in Kuwait was supported by normal OIF deployment funding. The U.S. military presence also had a significant impact on the Kuwaiti economy, through local contracts and purchases, housing and transportation for contractors and other purchases. The U.S. military has estimated that the direct annual economic impact of the U.S. military on the Kuwaiti economy was $6.2 billion. Of that, however, almost $2.6 billion consisted of fuel purchases which are either subsidized or could be sold for an equal price to another customer. From 2003 to 2005, Kuwait provided the U.S. military with free jet fuel for Operation Iraqi Freedom. From March 2005 until end-December 2008, it provided jet fuel at a discount. In 2008, the estimated cost of that subsidy to the Government of Kuwait in 2008 when oil prices reached record levels was USD 528 million (Kuwait 477). Subtracting out the fuel payments (since Kuwait would presumably have been able to sell fuel at a higher price), still leaves a direct economic impact of $3.6 billion. This figure does not take into account any multiplier effect of additional funds circulating through the Kuwaiti economy. It also does not directly address the fact that Kuwaiti companies, such as the global logistics giant Agility, grew rapidly by supporting the U.S. military. A U.S. Customs Advisory Team (comprised of two AMCIT personal services contractors and two local-hire support personnel) had operated in Kuwait since 1992, with the primary objective of providing training to the Kuwait General Administration of Customs (KGAC) on core enforcement issues including narcotics interdiction, narcotics investigations, terrorist financing/money laundering, financial investigations, intellectual property rights, and organizational structure. Working in close cooperation with Embassy, the Customs team has significantly enhanced Government of Kuwait capacities to address international crime with minimal intra-Government of Kuwait duplication of effort. The International Broadcasting Bureau (IBB) has operated a station in Kuwait (IBB/BGG) since 1993 under the terms of a twenty-year agreement. The facility, operated by three Amcit officers and twenty-six local hires, serves as a short and medium wave broadcasting facility and satellite gateway facility for IBB's global network. The station operated four 250 KW shortwave transmitters and two medium wave transmitters (one at 150 KW and one at 600 KW) as well as two FM transmitters. The station broadcasts BBG programming in several languages to target audiences in the Middle East and western Asia. In addition to its radio broadcasts, IBB Kuwait also uplinks to several regional commercial satellites, broadcasting direct satellite-to-home transmissions of BBG radio and television programs. The Kuwait facility also functions as a major network switching center, routing BBG programming to other BBG transmitting stations in Asia. In 2009 the facility built a third medum wave transmitter to enable direct broadcasting of Radio Farda (Persian language) programs to Iran, as well as expanding its ability to broadcast towards Africa and additional regions of Asia. For cost reasons (high local cost of land and salaries), IBB closed down its Ismaning facility in Munich, Germany in 2007 and moved the station's satellite gateway operations to the Kuwait transmitting station. The U.S. Federal Highway Administration (FHWA) has fielded programs in Kuwait since 1968 under the terms of a 1968 Consulting Agreement with Kuwait's Ministry of Public Works (MPW). Under the agreement, FHWA provides consulting services to MPW in the areas of highway planning, design, construction, administration and maintenance. FHWA staff in Kuwait also facilitate the travel of Kuwaiti highway engineers for technical training in the U.S. and the travel of U.S. technical experts to Kuwait to conduct technical courses. FHWA worked with MPW to develop a master plan to manage the overall operation and maintenance of Kuwait's highway system. For over twenty years, the US has been able to count on a Kuwaiti environment that permitted maximum operational freedom in the military sphere and others. While those days are not yet over -- and Kuwait's nervousness about being a small state in a dangerous neighborhood means they will want a significant U.S. presence for the foreseeable future -- many Kuwaitis believe that the time is approaching when the US can jointly look at a "right-sized" USG presence, particularly regarding the U.S. military presence and Kuwaiti support for the same. In part, this sentiment comes from a sense that the immediate danger from a weakened Iraq has diminished and, in part, it comes from an understandable Kuwaiti desire to redirect resources where possible to meet other needs. The Government of Kuwait -- and Kuwaitis in general -- retain a large reservoir of good will towards the U.S. and recognize their small size and dangerous neighborhood requires a protector, preferably the U.S. Consequently, they decidedly are not seeking to push us out the door. Nonetheless, many anticipate that as Iraq combat operations ended there would be a commensurate shift in the US military footprint, writ large.